For illustration purposes only. Not intended to provide exact representation of the Ark. 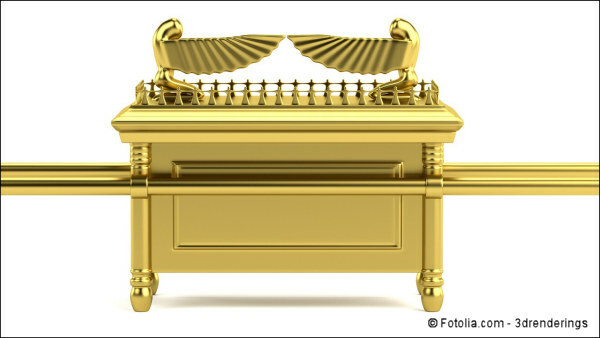 As part of the building of the Mishkan (English: Tabernacle) and its furnishings, God directed Moses to build a “kapporet,” an ornate cover to be placed on top of the “aron ha-b’rit” (English: the Ark of the Covenant). The aron ha-b’rit was an elegant box that contained the tablets of the Ten Commandments, a jar with a portion of manna, and Aaron’s rod that had budded. It resided in the Mishkan’s inner sanctum called the “kodesh ha-k’dashim” (English: the Most Holy Place), and it represented the very presence of God within the community of Israel. When the “Cohen Ha-Gadol” (English: the High Priest) entered the kodesh ha-k’dashim once a year at Yom Kippur (English: the Day of Atonement), the kapporet was the focus of his attention, for he was to apply the blood of the festival’s special sacrifices before it and over it (see Vayikra/Leviticus 16:11-4). The purpose of this ritual was to provide purification for the inner sanctum from the people’s uncleanness, transgressions, and sins. The kapporet was a lid made of pure gold overshadowed by the wings of golden “k’ruvim” (English: cherubim). The Scriptures tell us little about these creatures. We are introduced to them when Adam and Eve are banished from the Garden of Eden and God placed them to guard the tree of life. It is possible, therefore, that their being symbolically part of the kapporet was to remind Israel that the way to everlasting life remained blocked during the days of the Mishkan and its successor, the Temple. Many English Bible versions translate kapporet as “mercy seat.” This goes back to one of the earliest English Bible translators, William Tyndale, whose 16th century translation became the core of the King James Bible and much of subsequent English translation tradition. It appears that Tyndale’s rendering of kapporet as mercy seat is based on Paul’s use of the Greek equivalent “hilastērion” in his letter to the Romans as he refers to the Messiah Yeshua, “whom God hath made a seat of mercy through faith in his blood” (Romans 3:25; Tyndale’s version). Hilastērion is the word for kapporet used by the Septuagint, the early Greek translation of the Hebrew Scriptures, that was common in Paul’s day. While hilastērion had a different usage in Greek outside the Bible, Paul must have had its biblical use in mind, a connection that Tyndale choose to make abundantly clear. Regrettably, in my opinion, the translators of the King James Bible and many other later English translations chose not to preserve this connection. Instead most go with the pagan Greek meaning, “propitiation,” which is the idea of appeasing an angry god. Ironically, the King James and many other English translations that use “propitiation” in Romans retain Tyndale’s “mercy seat” in Exodus even though the reason for translating the kapporet as “mercy seat” is because Tyndale was drawing from Paul’s allusion in Romans to the place of God’s presence and mercy where cleansing occurs. You may not be aware of the great controversy among scholars over the meaning of Paul’s use of hilastērion. This is part of a discussion about how Yeshua’s suffering and death provides forgiveness and acceptance to those who trust in him. But however it works, let us not miss the power of Paul’s allusion. Through Yeshua’s giving of his life, he has become our kapporet – the place of mercy. What was once hidden and inaccessible has become available to all. If we put our trust in him, God purifies us once and for all, making us fit to freely enter his presence.